Four WAGS (Angie Doughty, Margie Jackson, Georgia Collins & Tan Tucker) set off from the North East to the Metropolis of London (well, Stratford actually) to fly the Vagabond team flag in the Prudential Ride London-Surrey. This ride was part of a massive festival of cycling in the capital. Saturday saw the Freecycle (in which 70,000 were reported to ride on the closed streets of London) followed by the Brompton World champs, the Women's Pro Grand Prix & youth events. But we had another challenge in mind – the 100 mile sportive following the Olympic Road route of 2012 on Aug 2nd. Some of us were well prepared, others (me) doing 100 miles for the first time and decidedly anxious about their ability. 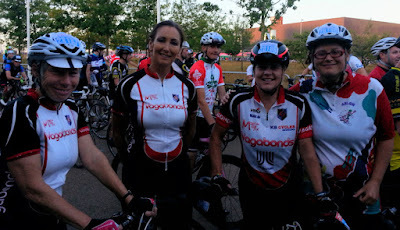 Read more: Prudential Ride London Surrey – the WAGS hit town! Following on from leading a successful series of Breeze bike rides for women, club member Tania Tucker is now continuing to organise club rides for Women (And Girls) independently of the Breeze rides scheme. 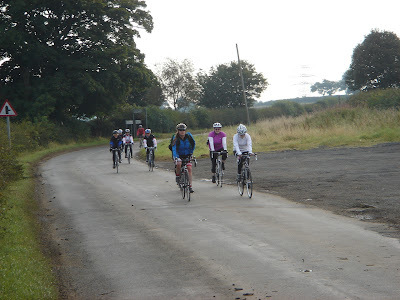 Rides are approximately 25-30 miles in length, taking in a cafe stop, and at a relaxed pace. Check the website calendar for details of the rides. Existing club members and potential new members are all welcome, but it's strictly for women and girls only! Rides start at 10am from the Ponteland Shopping Centre car park, and will leave promptly! !